How does any great trip to New Orleans start? With food of course! We arrived just about dinner time on Friday the 13th of March and picked up at MSY by our New Orleans resident and #1 son. We loaded our bags into the trunk and placed a box containing six frozen Chicago pizzas in the backseat and we were on our way. The first question we answered was – “You guys hungry?” We were, and knew that we were in for a great gastronomic guided tour over the next few days. 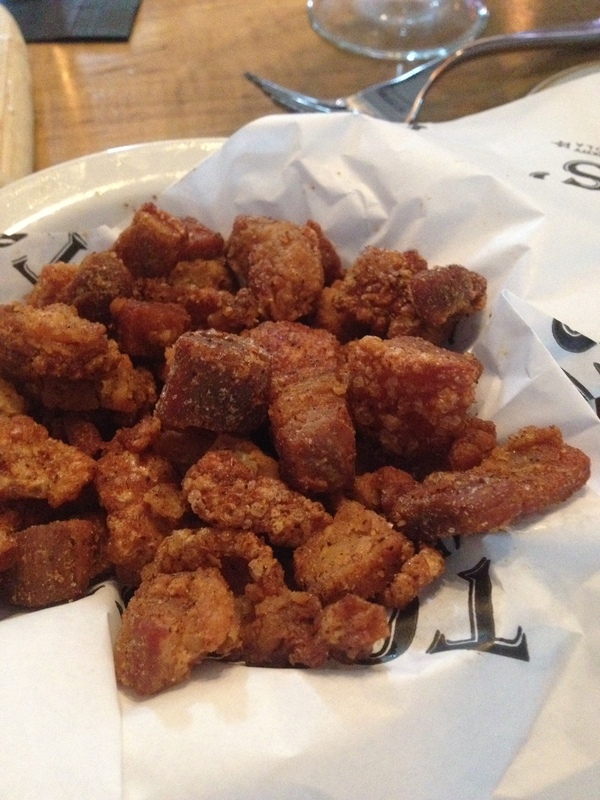 Our first stop was Toups Meatery located in Mid-town New Orleans. We ordered a couple of drinks and I had my first ever Beet martini. Mom always told me that beets were good for me, she would be so proud that I have found a new way to get these into my diet! 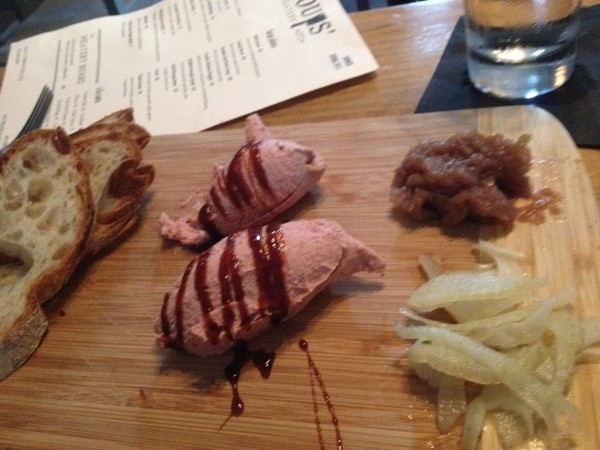 Each dish was full of flavor, texture and unusual tastes. The pate was smooth and tasty, the bone marrow was scooped out with a tiny tasting spoon and the chicken hearts reminded me of being a kid and tasting them for the first time on my Grandmas farm. 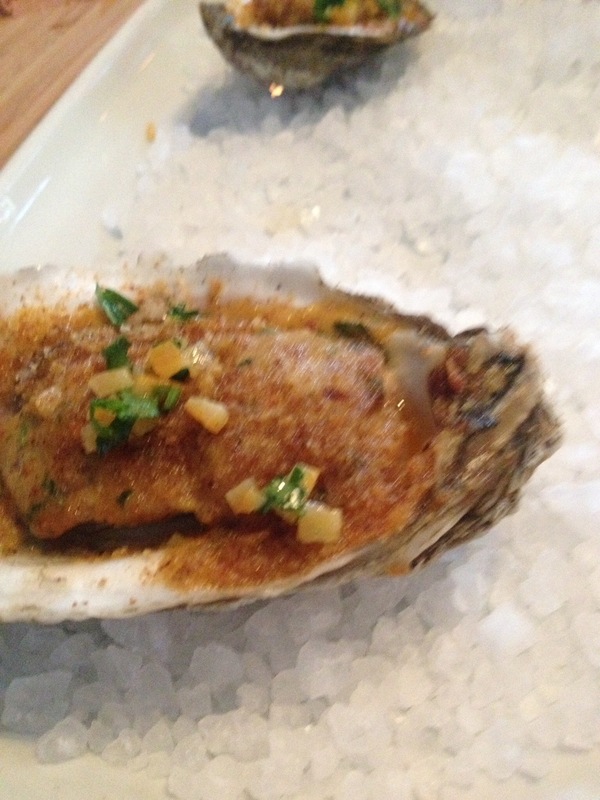 The baked oysters had a delicious breadcrumb topping that was perfectly crunchy to complement the chewy and tender oysters and the fried cracklings were a salty, melt in your mouth sensation that made us want to bring a bag home for snacking. And this absolutely tasty adventure was just our first stop! We decided to move on and have entrees at another spot, so we headed out to the car to join the box of pizzas. We rode down a street in the Irish Channel where preparations for the St Patrick’s Day parade were underway. 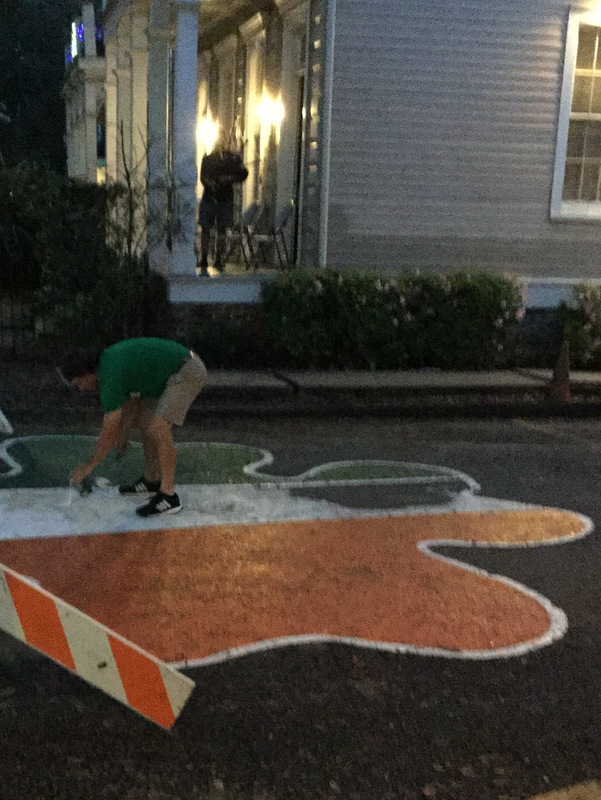 As we went by there was a guy painting a shamrock on the street while a bagpiper played an Irish serenade setting the mood for the coming festivities. We arrived at La crepe Nanou,about 7pm. We did not have a reservation so we took at seat at the bar. #1 lives across the street so he brought the pizza’s to his freezer and we barely finished our first cocktail while keeping good company with a mermaid, when the maitre’d told us our table was ready. #1 Son knew the owner and that may have speeded our seating, but the bar is cozy and a good place to observe patrons and soak in some local NOLA neighborhood vibe. Once seated we ordered an appetizer of escargot with some fresh bread to soak up the garlic butter they were floating in. We sampled the French onion soup that #1 ordered and it was absolutely perfect. We had crepes for dinner, mine was spinach, mushroom and cheese and Hubby and #1 had the crab crepes. 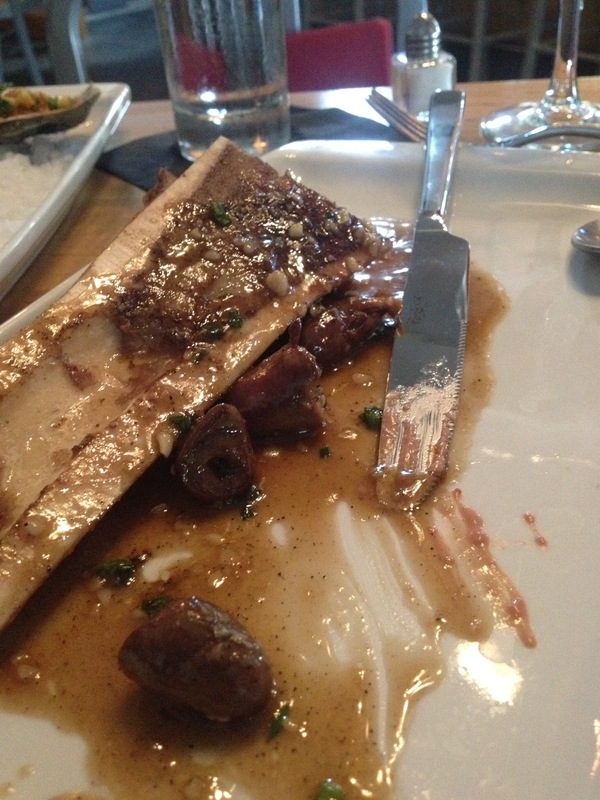 Everything was absolutely delicious and our server was professional, attentive and very good at his job. We decided that we could not pass up dessert, so we ordered the crepe Nanou to share between the three of us. 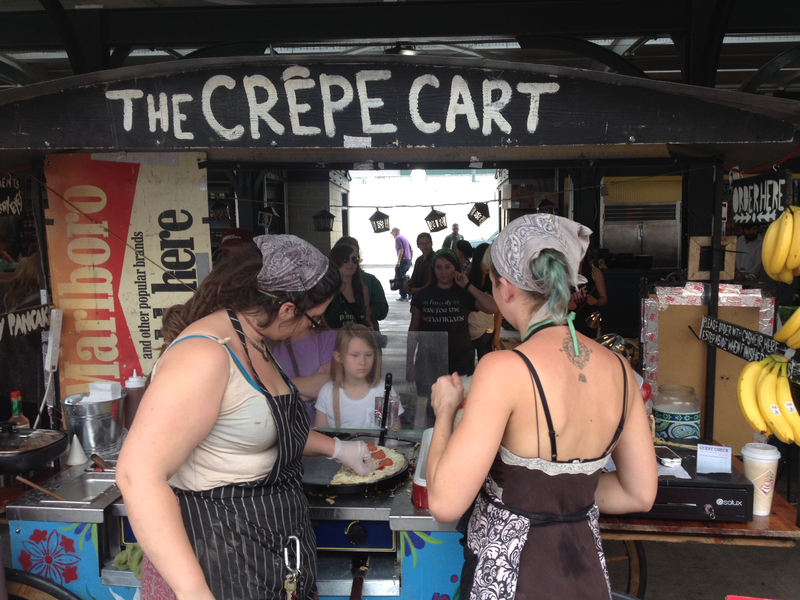 Is was a crepe filled with coffee ice cream, vanilla bean and chocolate ice cream drizzled with chocolate sauce. The evening was a great way to spend time together and visit with our son to catch up. We left and headed to our hotel. 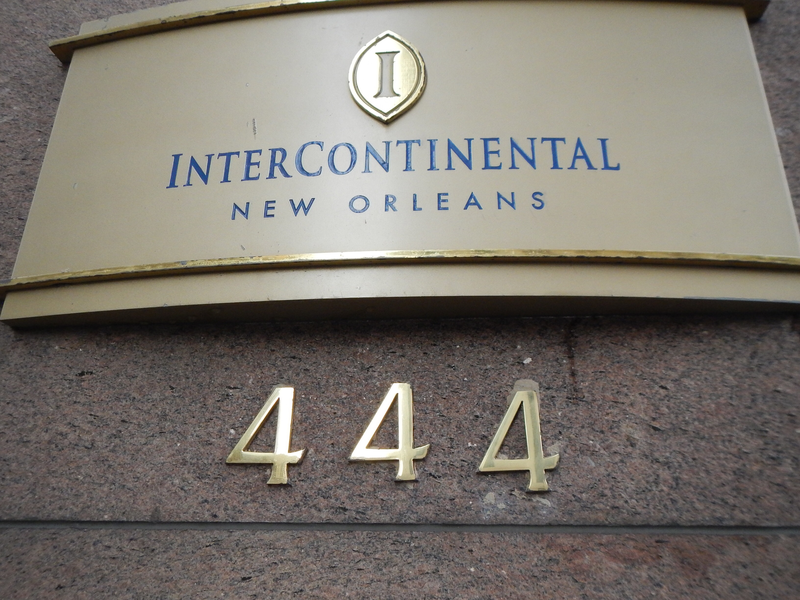 We stayed at The Intercontinental at 444 St Charles Street, near the French Quarter. 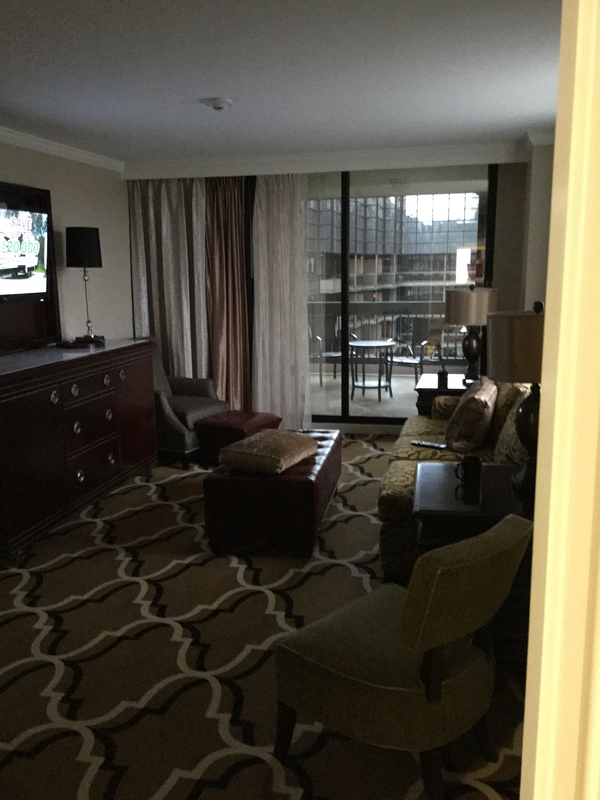 We were delighted when we arrived to a great southern welcome and given an upgrade to a suite. At checkin we met the night manager and he told us that this is the suite they give to Sean Payton when he stays with them. 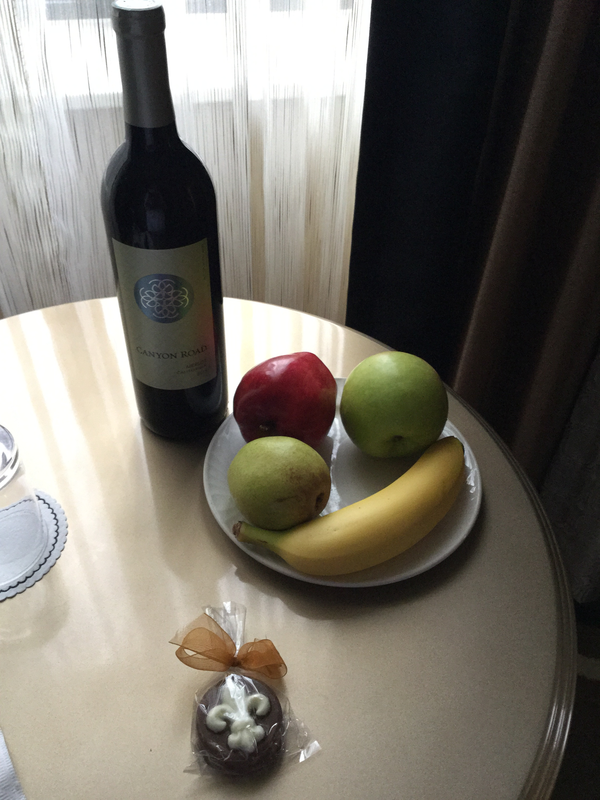 We opened the door of our room to a beautiful table filled with wine, chocolate, and fruit. There was a King bedroom, beautiful remodeled bath, living room and an outdoor patio where the sights and sounds of NOLA could be enjoyed. We turned in for the night, happy and looking forward to the next day when we would be touring the National World War II museum. Our Saturday started with breakfast at our hotel. The buffet is huge and looked delicious, but we both thought that was a lot of food so we opted for a fruit plate and to split an omelet. It was a delicious way to start our day. It was beautiful 70 degrees and sunny outside so we walked the 10 blocks to the museum. We marveled at the trees covered in beads and recovering from past Mardi Gra parades and celebrations. We arrived at the museum about 10:45. There was a line that moved quickly for tickets. We purchased museum entry and the Beyond all Boundaries 4D movie for 2pm. The lobby of the museum is wide open and there are helpful staff roaming around to answer questions. We followed a group into a conference type room and sat down to listen to a brief talk about the museum. A lively older man was the speaker and gave some great insight about why the museum is located in New Orleans, I won’t give it away, but a product that they produced in NOLA during the war was given credit by General Eisenhower for winning the war. After walking through the museum and learning more I can understand why he would have said that. We spent 6 hours in the museum and could have been there longer if they would not have been closing. This is a great experience for young and old alike. 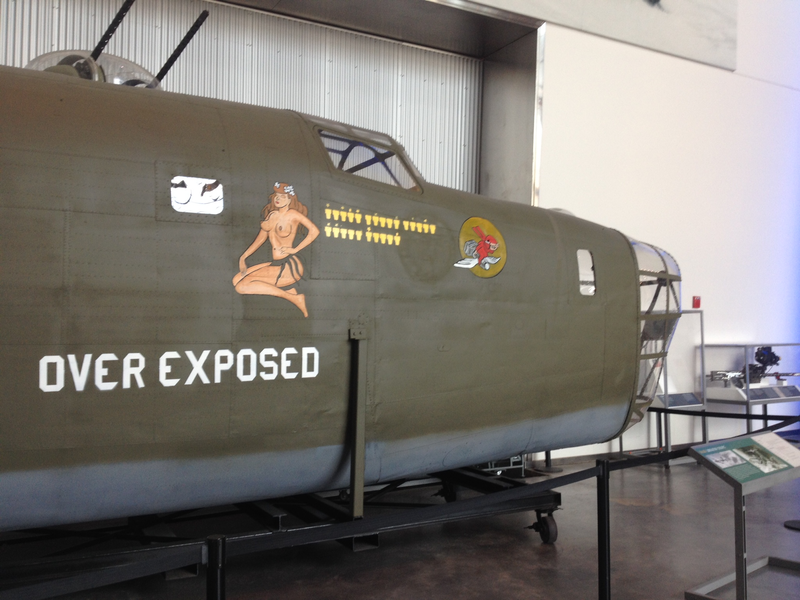 There is a detailed history, along with artifacts, but the element that truly brings the story of what happened during that time in our countries history was the personal accounts by WWII vets. We heard one speak when we dropped in to the first talk of our day. He was a 91 year old veteran Marine named Burt. He was proud to have served and by the time he finished I needed a tissue. 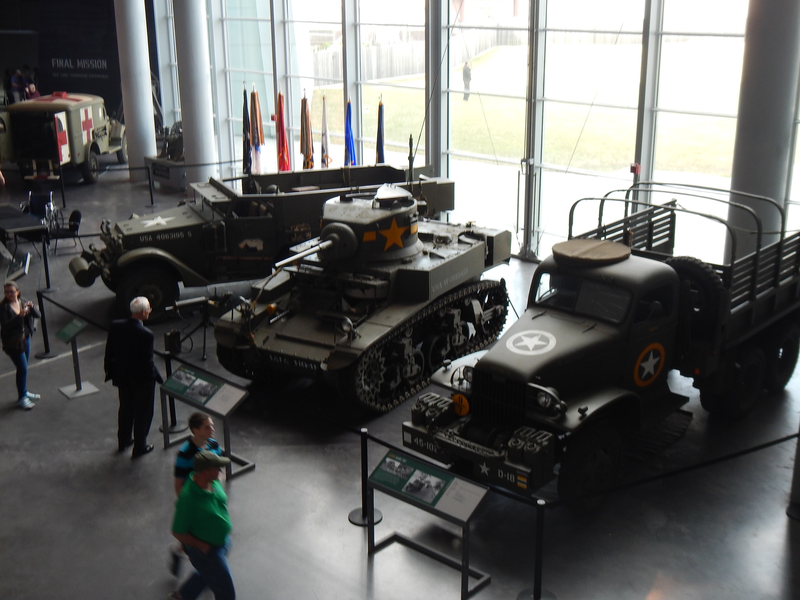 All exhibits have an element of the personal stories from the era, battles or experiences of those who served. Personal stories and the detailed history of the war helped us all understand truly that Fortitude means – courage in pain or adversity. The informal term is “guts”, and we learned very clearly what brave heroes there were from not just America, but many countries around the world. We walked across the street to the museum that has the Beyond all Boundaries Movie which lasts about 45 minutes. The movie is well worth it as it covers a lot of information and it is narrated by Tom Hanks. Afterward we ate lunch at the American Sector restaurant located on the opposite end of this building and it was really good! We had burgers and a barbeque chicken flatbread with some local beers. The menu has a nice variety and there is an outdoor patio just outside, though we sat at the bar to eat. It was a very nice spot and a nice meal. 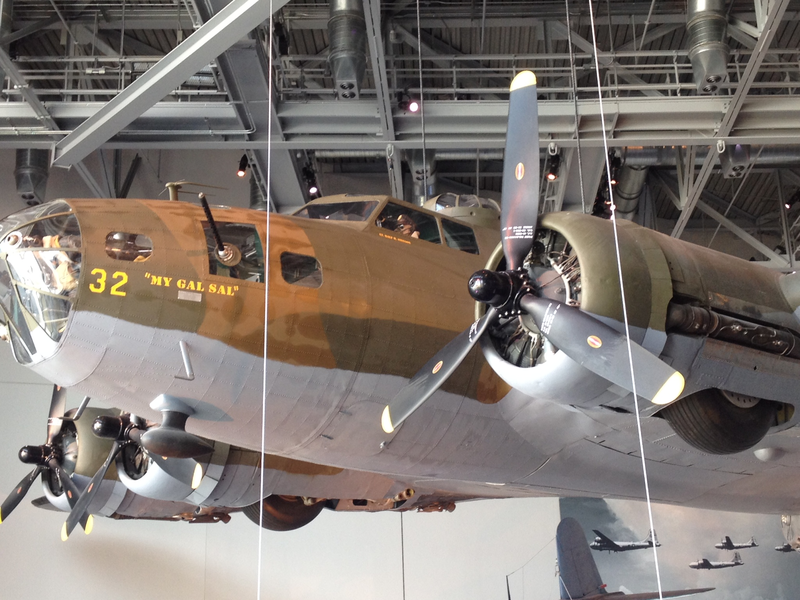 We walked over to the building that houses several airplanes including “My Gal Sal”. You can ascend the building so you are high enough that you are looking straight at the airplanes on the 4th level. It is a bit dizzying at first, but such a thrill to get so close. 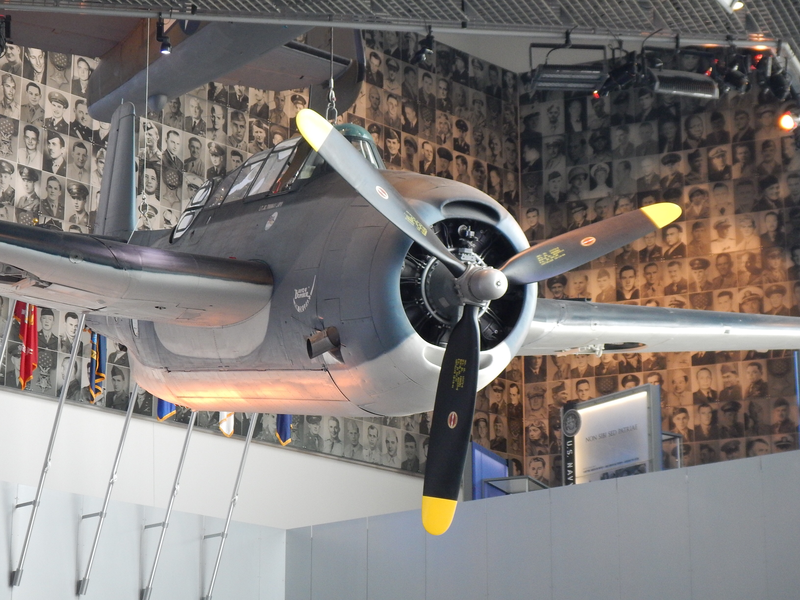 We stayed here for quite awhile, viewing exhibits, airplanes, vehicles, campsites and learning more and more. The final building is where you can scan a dog tag card that was issued at ticket purchase. It is here that you can walk in the shoes of the person you were given at “check in” to the museum. It is the final way to truly hear about the people and what they experienced during the war. We headed back to our hotel for a rest and refresh and decided on the John Besh restaurant Luke for dinner. LUKE is located just across the street from the Intercontinental Hotel and in the same building as the Hilton, so it was very convenient and #1 son had said it was a terrific restaurant. Our reservation was for 9:15pm and most of the rush was over leaving the restaurant lively, but not loud. We ordered the Flamenkuchen as an appetizer it is a thin alsacien onion tarte with bacon and emmenthaler cheese. Our entrees were outstanding I had ,Jumbo Louisiana Shrimp “en Cocotte” which had roasted jalapeño cheese grits, andouille & green onion sausages, Hubby had the Entrecôte Grillée Et Frites, a grilled ribeye with sour mash steak sauce. He hardly ate any sauce because the flavor of the steak was outstanding! We finished dinner with a dessert of Bourbon vanilla bean crème brulee. As we were finishing dessert we had some fun and photo bombed a table of 4 people. They laughed and were very good natured – telling us “Nice Photo Bomb”. I guess even us middle age adults revert to our mischievous young adult behaviors now and again. After dinner we walked about 6 blocks to the French Quarter and Bourbon Street. It was a hectic night with many people partying pretty hard because it was St. Patrick’s Day weekend. We walked in the midst of the drunken crowd watching revelers from balconies above tossing beads down to people begging for them on the street. We did not see many women using the traditional tactic, but there were a few. 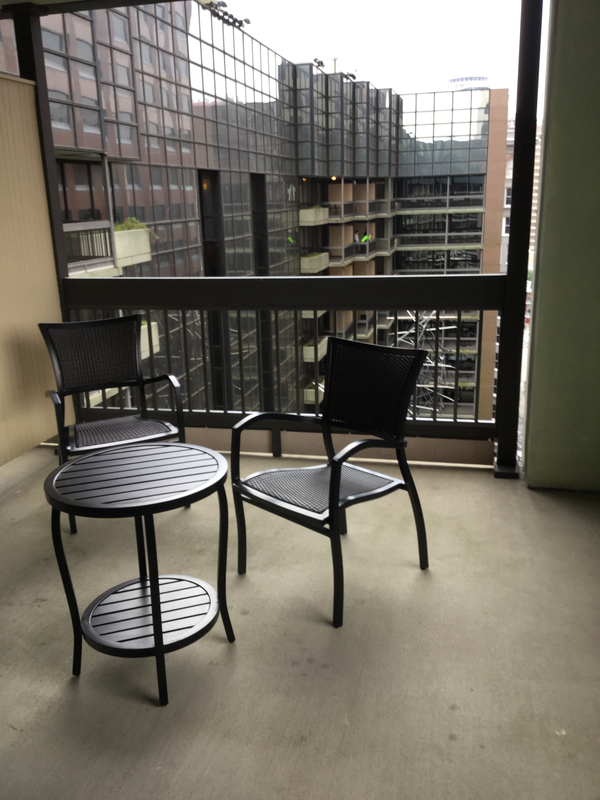 We found some respite in the quiet courtyard at 311 Bourbon St., it is called Musical Legends Park. We heard the Steamboat Willie Jazz Band play for a bit, bought a CD from them and headed back to the hotel. We saw the couples we had photo bombed at the restaurant and they waved hello and smiled. We felt like it had been a full day but what a great time we were having. 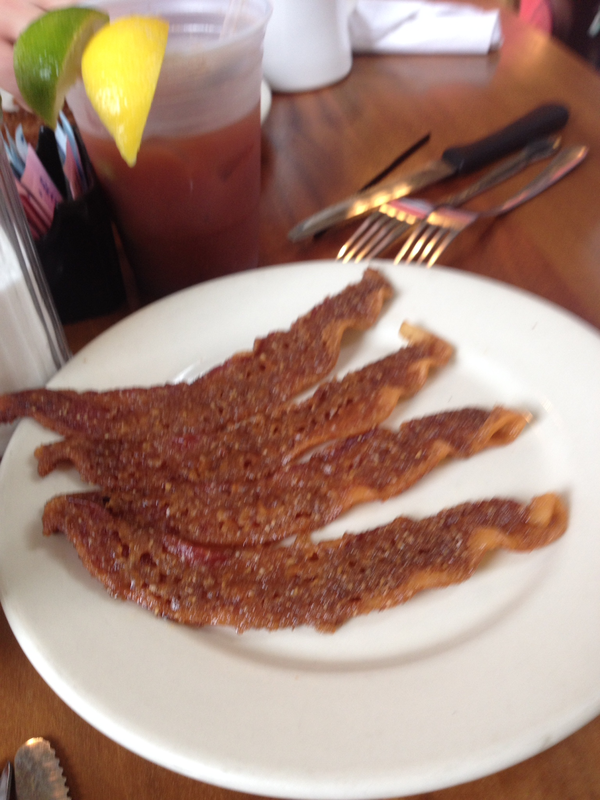 We ordered the praline bacon as an appetizer – yes – an appetizer for breakfast! The daily specials of Huevos Rancheros and Crabby Eggs sounded outstanding, and our son likes the traditional Elizabeth’s eggs. 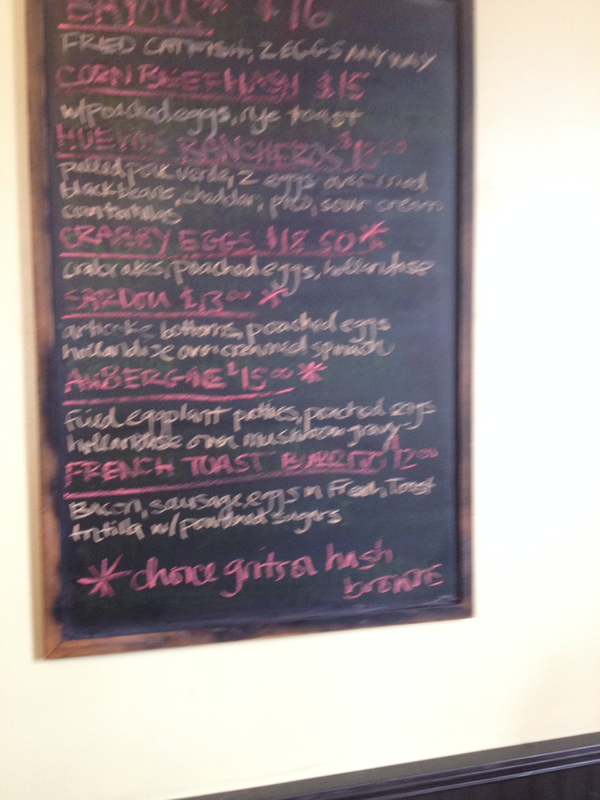 We placed our orders and just enjoyed watching people stream in for brunch. We were the first to be seated upstairs, but by the time we finished the entire first and second floor were full of people and there was a line outside. Our meal was outstanding, the artwork by Dr. Bob was entertaining and we left really stuffed full of good food and happy feelings. Our next adventure was a drive through City Park and over to Lake Pontchartrain. It is nice when you know someone that lives in a place like New Orleans, #1 son was able to drive us past some beautiful homes, neighborhoods and provide context on the city that we would not know if he were not there providing the ongoing answers to our questions. After our drive we found a parking spot in the French Quarter and walked toward Mollys at the Market for an Iced Irish Coffee (yum!). The guys sat at the bar and I wandered to some of the shops for a little retail therapy. There is a wide range of items for sale from slogan t-shirts to handmade jewelry and a couple of shops with items from Morocco and Africa. It made for an interesting browse. 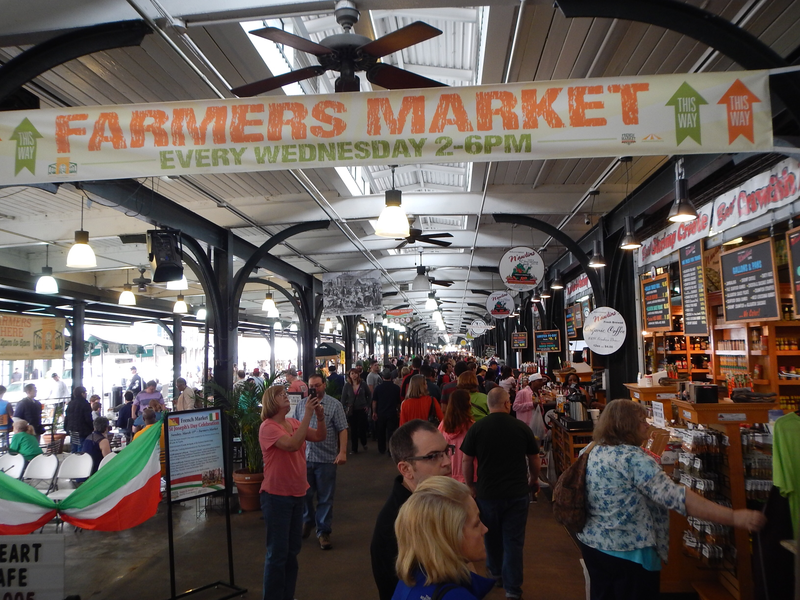 We ended up taking a short walk through the French Market. 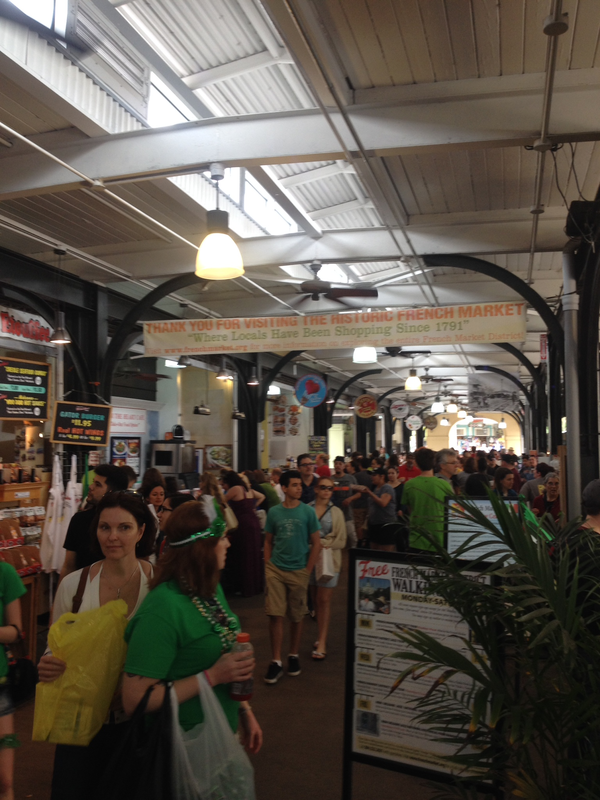 The Sunday market was bustling, full of booths with t-shirts, souvenirs and spices and flavorings native to New Orleans. 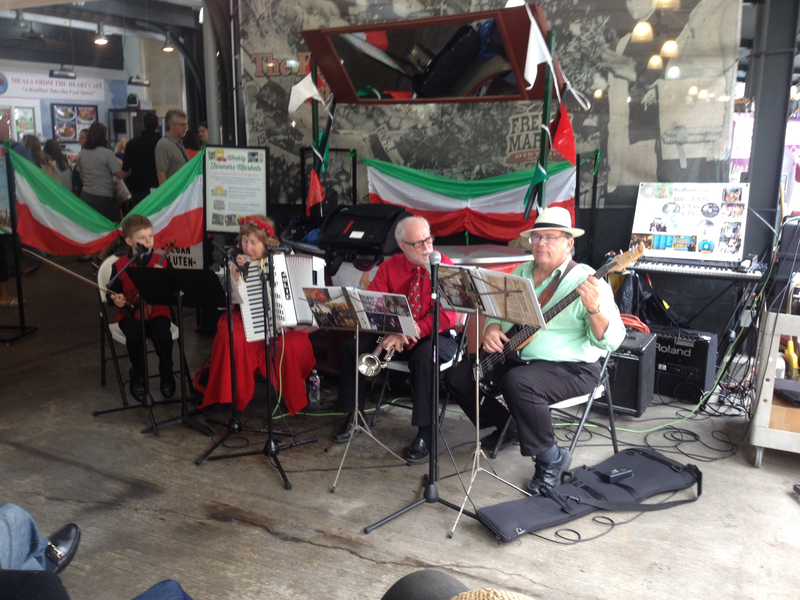 We saw a band playing for St. Joseph’s day Celebration, A couple of girls serving up different kinds of Crepes and many people dress up in their St. Patty’s day green. 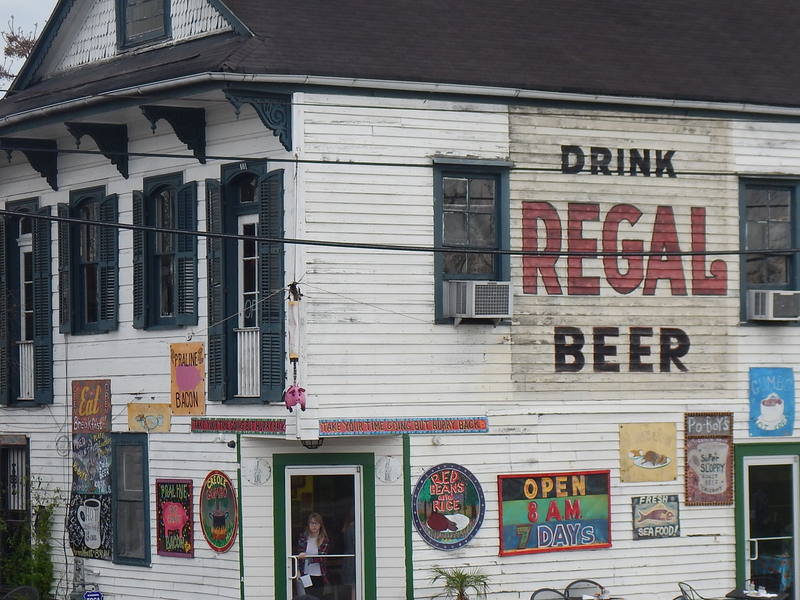 It was a place alive with tourists, artists and the sounds and smells of NOLA. We headed back to our hotel to enjoy the outdoor patio and watch a bit of the F1 race replay from earlier in the day. Our plan was to have a nice dinner one last time that evening with #1 son so we targeted a 6:30 dinner. 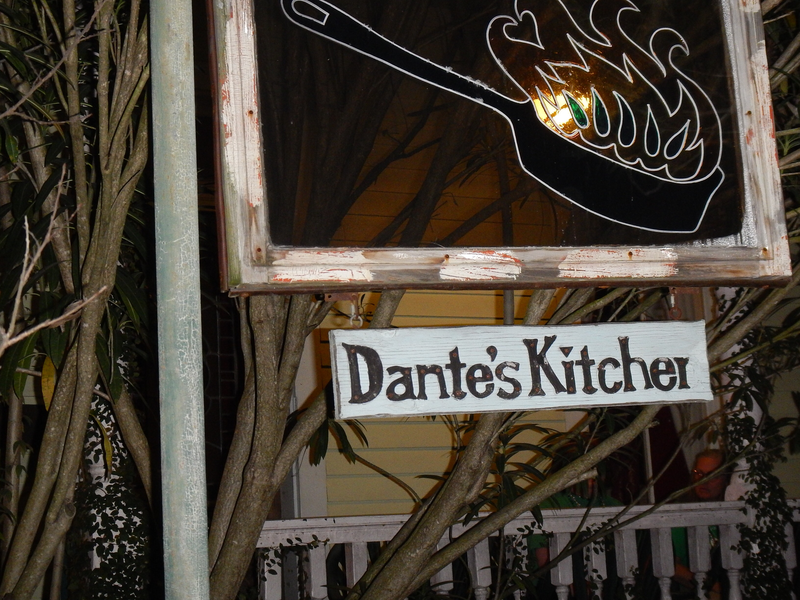 Our final meal was set for Dante’s Kitchen, son said it is one of his favorite places. It is housed in an older home on a corner with outdoor seating available and a welcoming front porch. They serve sustainable and locally sourced foods. We had Steamed Mussels and Charred French bread for an appetizer and our entrees were Trois Mignon, Red Fish and a duck entrée for #1. The sides to accompany included brussel sprouts, mashed potatoes and Roasted Fingerling Sweet Potatoes with pecan brown butter crumble and house made marshmallows. Everything was absolutely perfect. 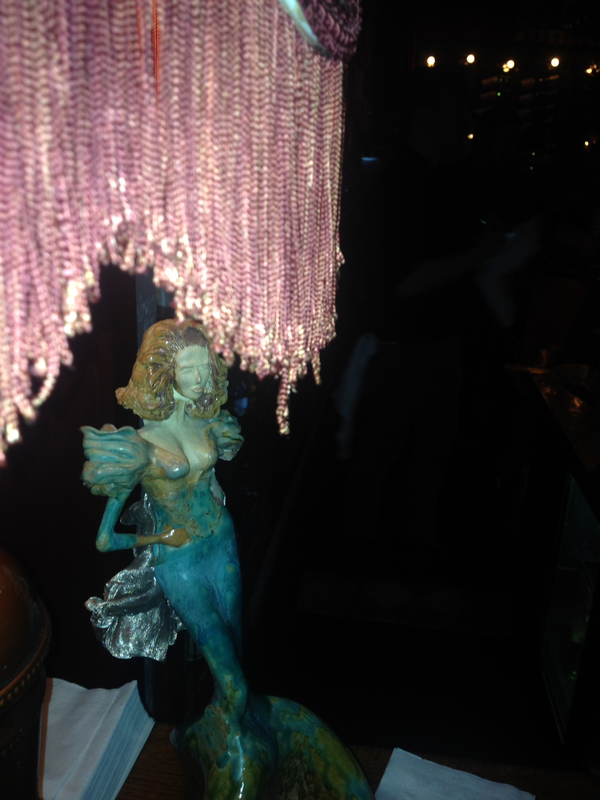 The ambiance of the restaurant is relaxing, romantic and made it feel like a quiet Sunday Dinner at home. We left the restaurant relaxed and very full. We wanted to hear some jazz on Frenchmen Street, so that was our next stop. We arrived about 8:30pm and the entire street was lively and full of music. I had checked the website and knew that there were about a dozen acts scheduled, so we just walked from place to place stopping where we felt there was something that sounded great. 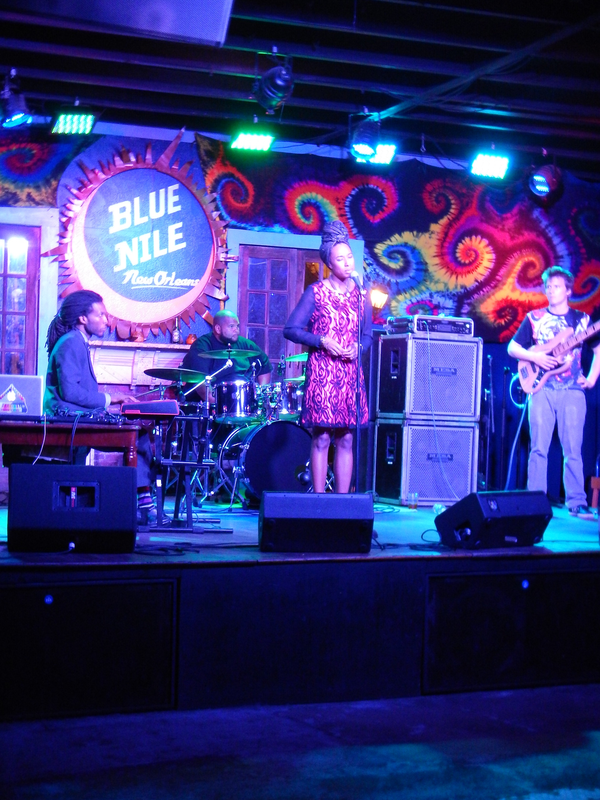 We stopped at Blue Nile for a little while and heard some great soulful jazz, and watched as the crowd grew. There were lovers, friends, tipsy people and some people that were just there to take it all in. We decided to walk off dinner and make one more trek through the French Quarter and down Bourbon St. It was about a mile back to our hotel, but there is so much to see, watch and experience the walk does not feel long or tiring. We woke up on Monday morning packed and visited LUKE restaurant one more time for breakfast. I ordered the stuffed French toast, after all that would be my last diet splurge for a while, Hubby had a breakfast biscuit with ham, cheese and bacon. We had eat and drank well all weekend and we reflected on what a nice weekend it had been. We were feeling good because we were able to spend one on one time with #1 son – an infrequent occurrence with a large family and many miles between us. 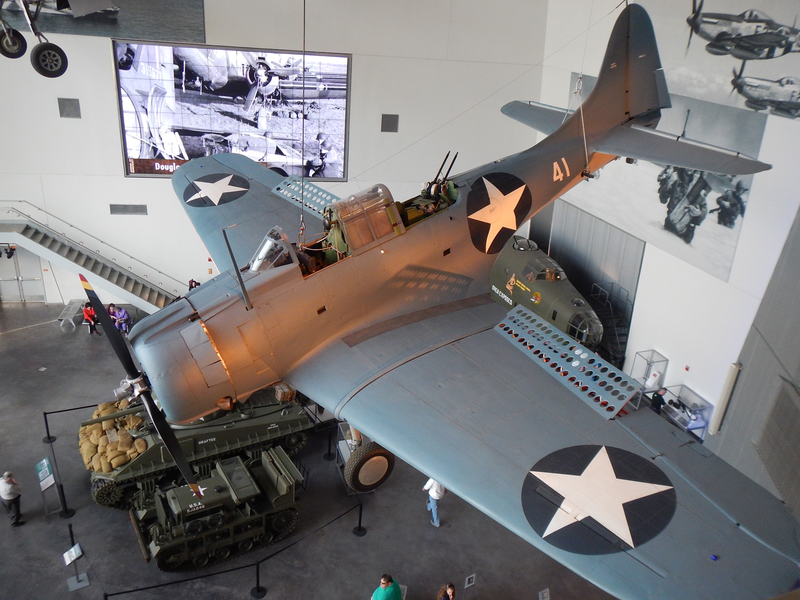 The three of us had spent time dining at really good restaurants and learning about New Orleans from our local family resident, and we experienced the history behind World War II and the fortitude and guts it took to keep our nation free. We finished our weekend with a thankful sigh for the time, abundance and freedom of our lives. A very good thing. 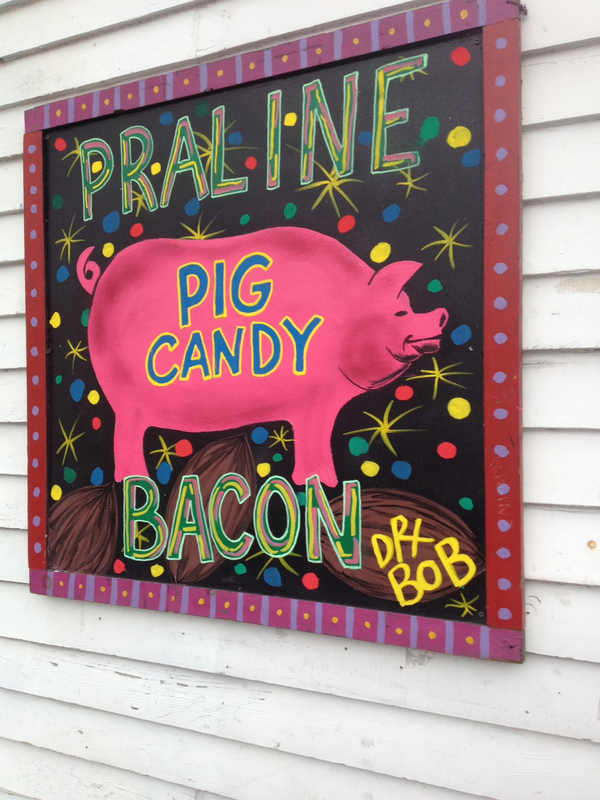 Praline Bacon just sounds good right now!